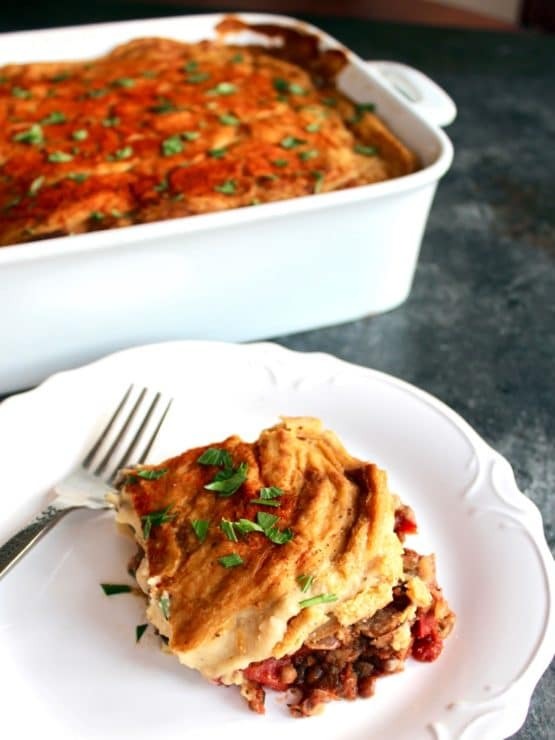 For a special occasion, this Hummus Baked Vegan Moussaka is the ultimate hearty meatless entree. Free of meat and dairy yet full of flavor, it features layers of flavorful roasted vegetables, a lentil-mushroom filling, and a delectable baked hummus topping. This flavorful casserole is sure to impress. Lately I have been working on developing meatless, dairy-free entrees that can be served for holidays and other big occasions. This Hummus Baked Vegan Moussaka is my latest experiment, and it turned out better than I ever could have anticipated. When developing vegan recipes, I refuse to sacrifice on flavor, especially when it comes to the holidays. It can be more difficult to capture a savory, hearty flavor using only plant-based ingredients. 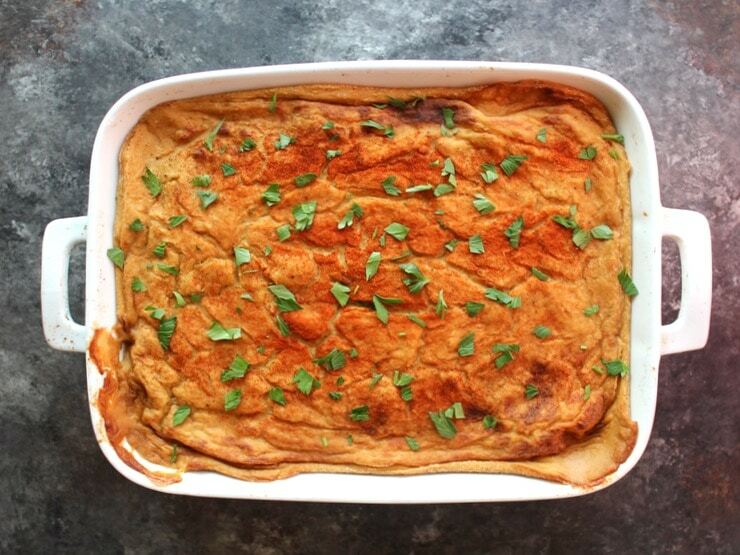 I have served this Hummus Baked Vegan Moussaka to numerous meat eaters and received raves all around. Time to share! The biggest challenge here was how to capture that top layer of baked béchamel sauce. Most vegan béchamel recipes I tried left me unimpressed. I decided to go in a completely different direction by making a sort of hummus-béchamel hybrid topping. It worked out better than I ever could have dreamed! 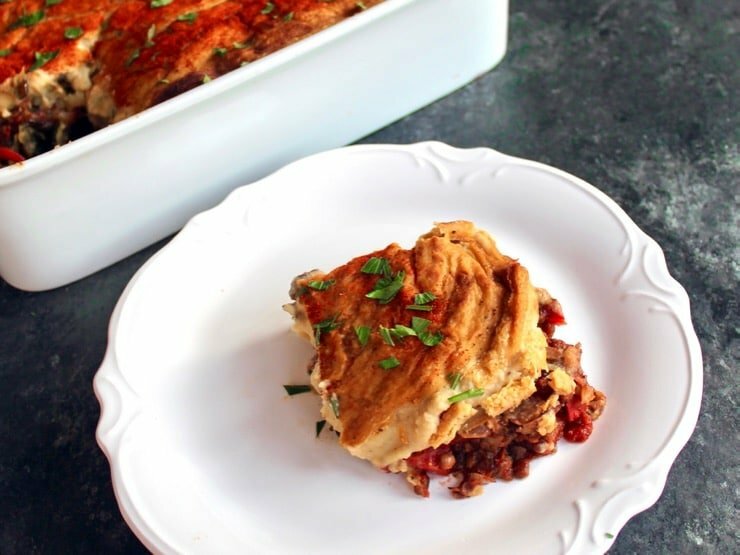 This Hummus Baked Vegan Moussaka will now be a regular part of our holiday meals! It works as a vegan or vegetarian entree; it also doubles as a hearty and impressive side dish. A word of caution – this recipes takes a lot of time and effort to make, and is not the greatest choice for a newbie in the kitchen. Plan ahead, measure out your ingredients beforehand, and consider making the majority of this dish ahead of time to save you from scrambling on the day you serve. Good news – this dish tastes even better when you assemble the majority of it a day or two ahead! 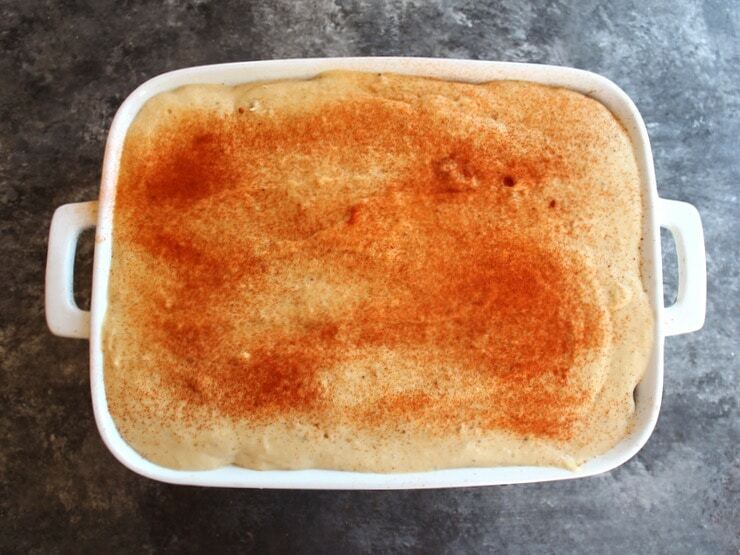 Looking for a vegetarian version of this recipe with cheese and a traditional béchamel topping? 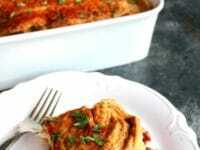 Try my Roasted Vegetable Moussaka. 3 cups diced ripe red tomatoes OR 2 cans (15 oz. each) diced tomatoes - I like using fire roasted! 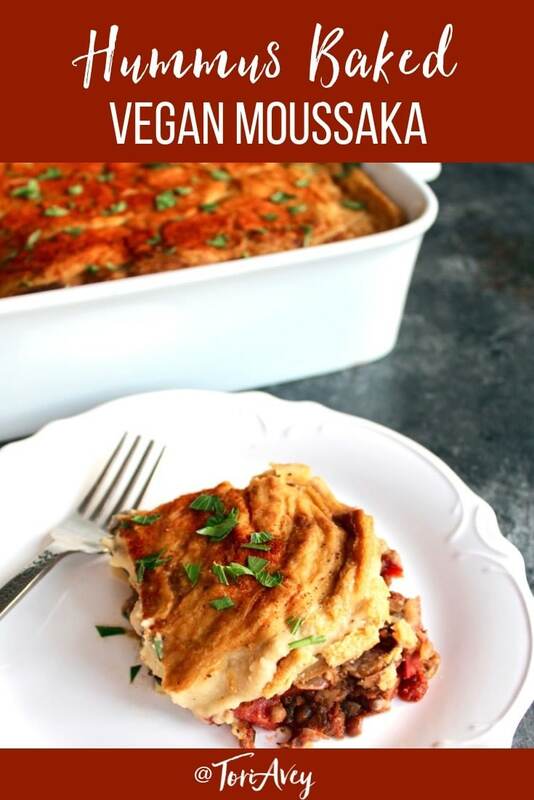 TIME SAVING/MAKE AHEAD NOTES: This vegan moussaka takes quite a bit of time to prepare, but you can cut down the prep time substantially with a few simple modifications. 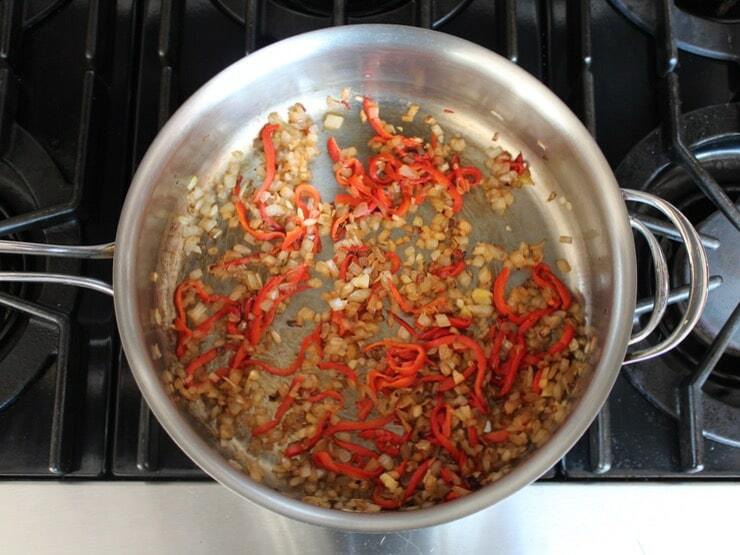 Buy jarred roasted peppers so you don't need to roast them yourself and buy pre-steamed or canned lentils. Prep all of your vegetables in advance and have all of your items ready to assemble for both the moussaka and the sauce; pausing to hunt for or measure an ingredient every few minutes will increase your cooking time quite a bit. The better you are organized from the beginning, the faster the process will be! I also highly recommend making this dish a day or two ahead, roasting the vegetables and assembling everything before the hummus topping. Cover the assembled vegetables and refrigerate for up to two days ahead. It's best to make the topping when you are ready to bake. Nutrition Note: if watching sodium intake, you can cut the sprinkle of salt on the roasted vegetables, though I do recommend it for flavor. I have calculated about 3/4 tsp of salt total for all of the roasted vegetables, so cutting this will bring the sodium down quite a bit. Please refer to Time Saving/Make Ahead notes above, especially if this is your first time making this moussaka. It's a long process. You've been warned! Place racks on the upper and lower thirds of your oven. Preheat oven to 500 degrees F. Grease two baking sheets with 1 1/2 tbsp extra virgin olive oil each. 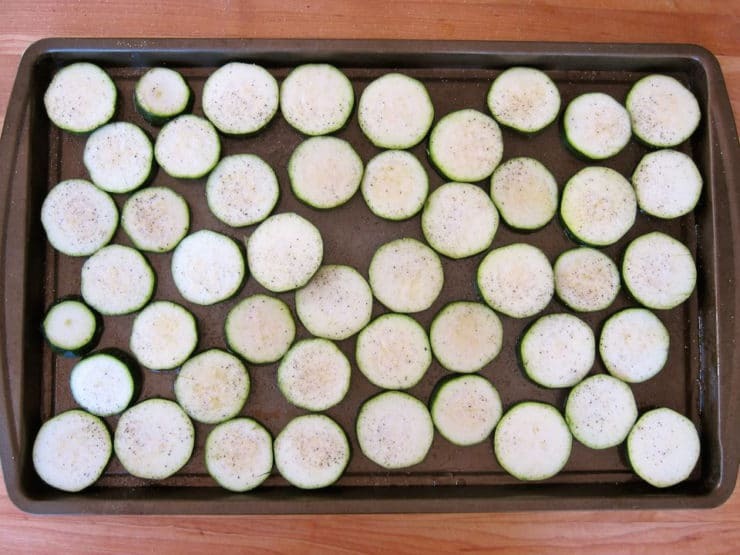 Spread out the zucchini on one sheet, the potatoes on another, and add the 3 garlic cloves to one of the sheets. The vegetables may overlap in a few places, which is fine. Brush veggies lightly with a little more olive oil and sprinkle lightly with salt and black pepper. Place baking sheet with potatoes on the upper rack of the oven. Place sheet with zucchini on the lower half. Roast veggies for 10 minutes. 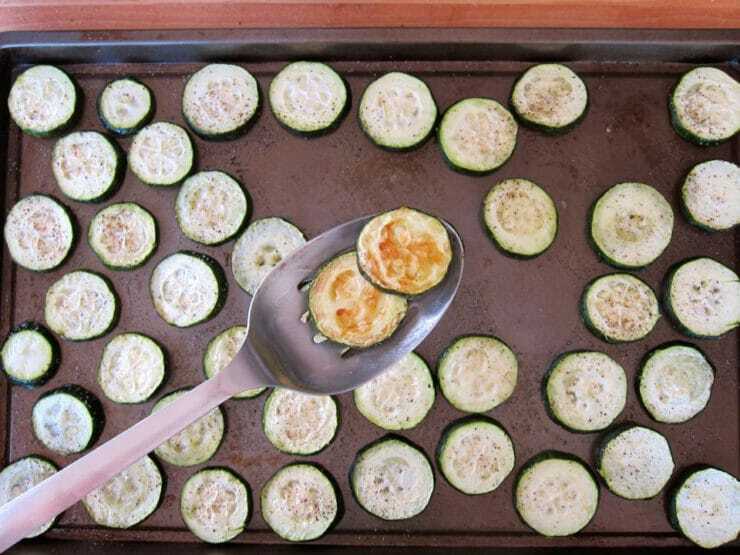 Remove sheets from oven and place them back in the oven, switching racks (zucchini and garlic on top, potatoes on bottom). Do not flip the vegetables themselves. Roast for about 5 more minutes, until veggies are tender and turning golden brown (check the bottoms of the veggies for browning). 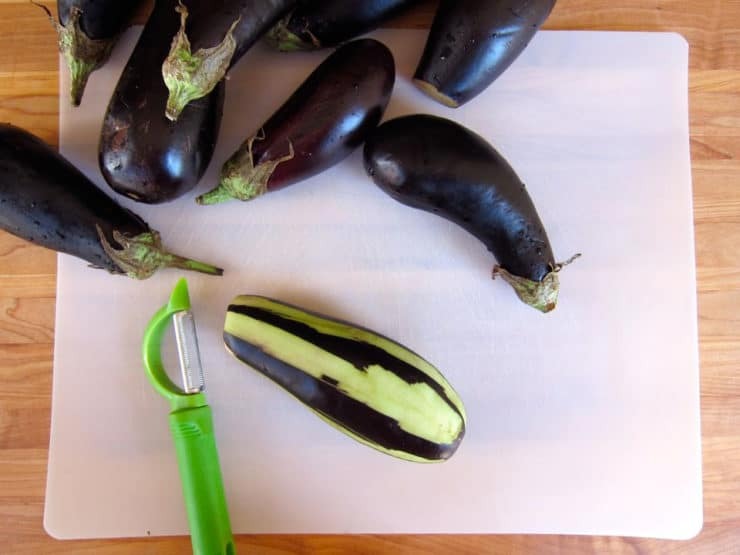 While potatoes and zucchini are roasting, remove the stem ends from the eggplants. Peel strips from the eggplants so that they have thin stripes of peel remaining down the sides (they will be half-peeled). Cut the eggplants into slices a little thicker than 1/4 inch. 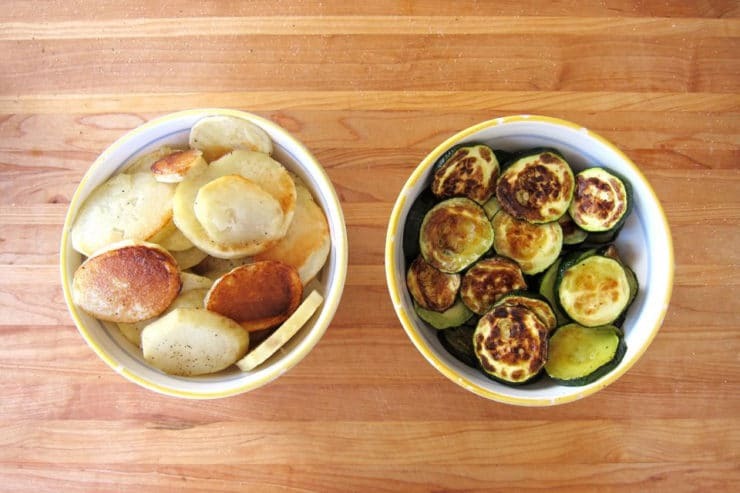 When potatoes and zucchini are done roasting, remove them from the oven and scoop veggies into a bowl using a slotted spatula. Take the 3 roasted garlic cloves and chop them, reserve. Re-grease the baking sheets with 1 1/2 tbsp olive oil each. 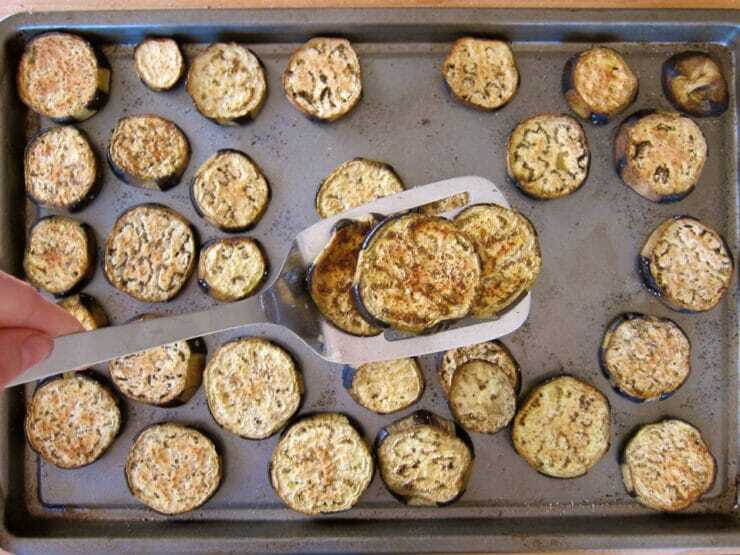 Spread eggplant slices into a single layer across the two baking sheets. Sprinkle lightly with salt and pepper. Place the baking sheets in the oven and roast for 10-15 minutes, switching the baking sheets on upper and lower thirds halfway through cooking, until the slices are tender and lightly golden (check the bottom edges of slices for browning). While eggplant is roasting, place a sauté pan or skillet with high sides on the stovetop. Warm up 2 tbsp olive oil in the pan over medium high heat. Add the mushroom slices and turn heat up to high. 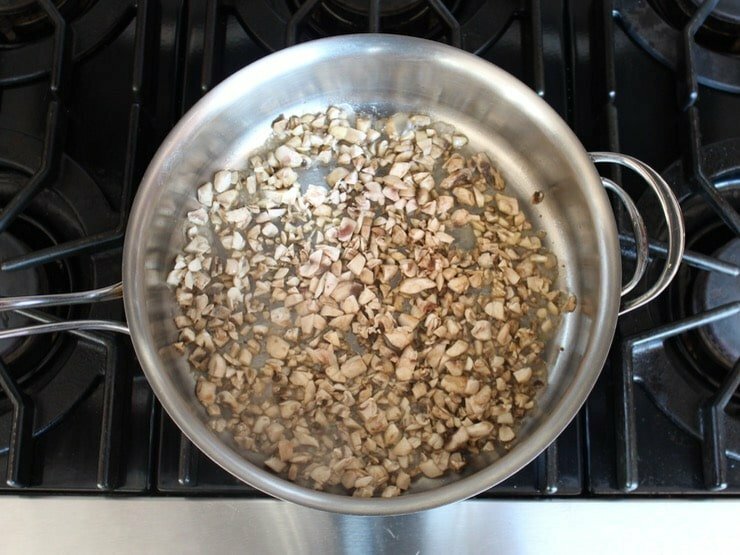 Let the mushrooms sear for 2-3 minutes without moving them. 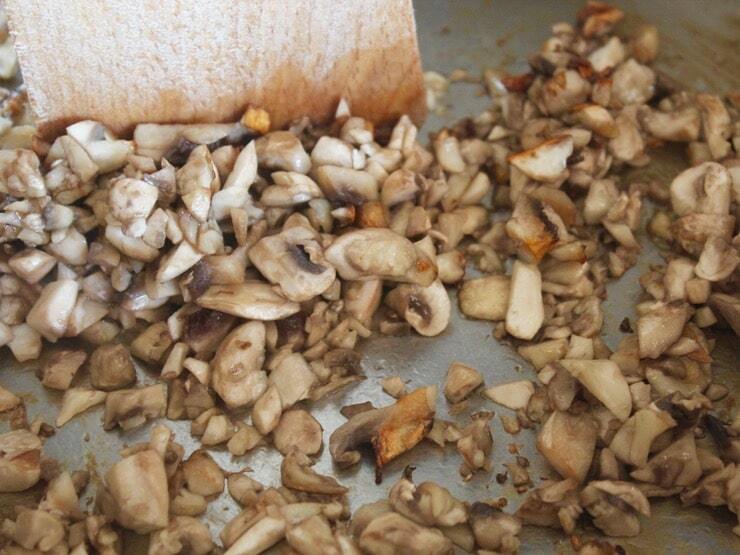 Begin to stir after 2-3 minutes, when the bottoms of the mushrooms turn golden. Sauté for another minute or so. Remove the mushrooms from the pan and reserve. 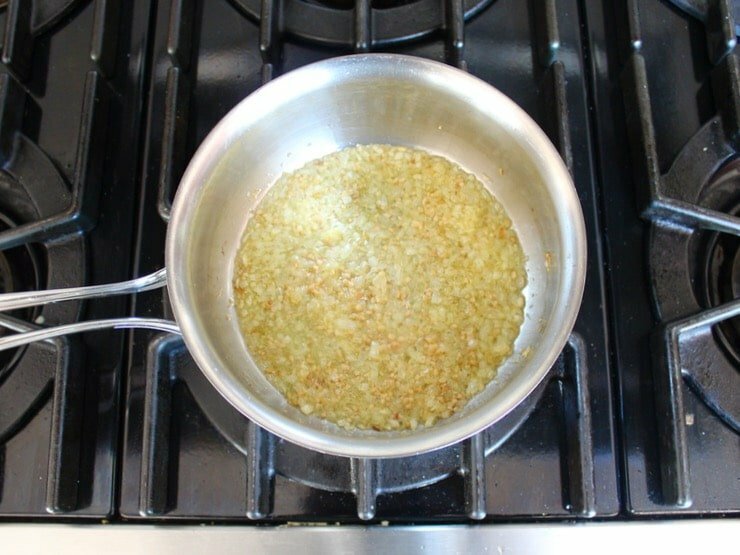 Reduce pan heat to medium and add another 2 tbsp olive oil to the pan. Sauté diced onion until softened and translucent. Add roasted bell pepper slices and chopped roasted garlic, saute for another 2 minutes. Add cooked lentils, reserved mushrooms, diced tomatoes, fresh dill, oregano, cinnamon, smoked paprika, cayenne pepper and 3/4 tsp salt to the pan; stir well. Reduce heat to medium and let mixture cook for about 5 more minutes until warmed through. 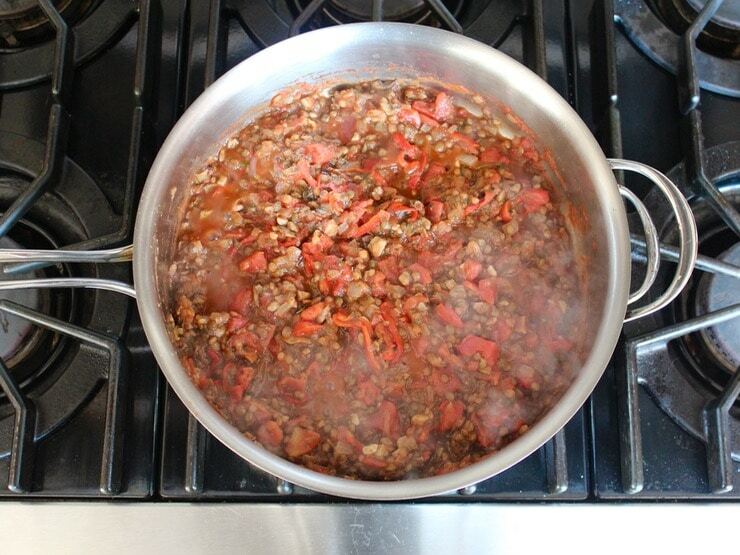 If using fresh tomatoes, let the mixture cook for 10 minutes until tomatoes are soft. Add salt or pepper to taste if desired. When eggplant is done roasting, remove it from the oven. 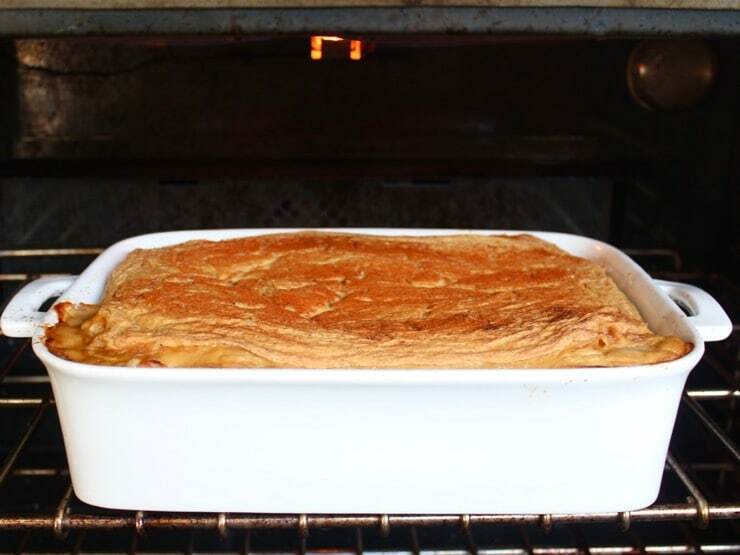 If you plan to continue baking the full moussaka now, reduce oven temperature to 375 degrees F. If making ahead, you can turn the oven off at this point. 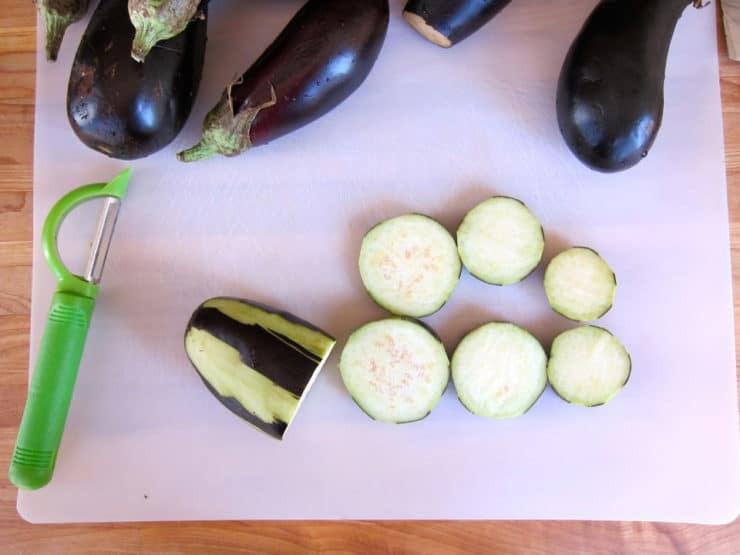 Use a slotted spatula to scoop up the eggplant slices and place in a bowl. Lightly grease your baking dish or pan. 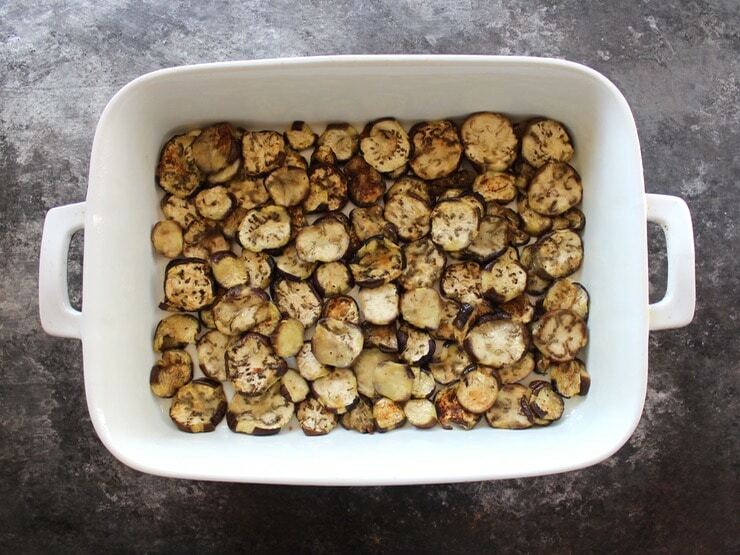 Place a single layer of half of the roasted eggplant slices on the bottom of your dish. On top of that, place a layer of half the potatoes and half the zucchini. 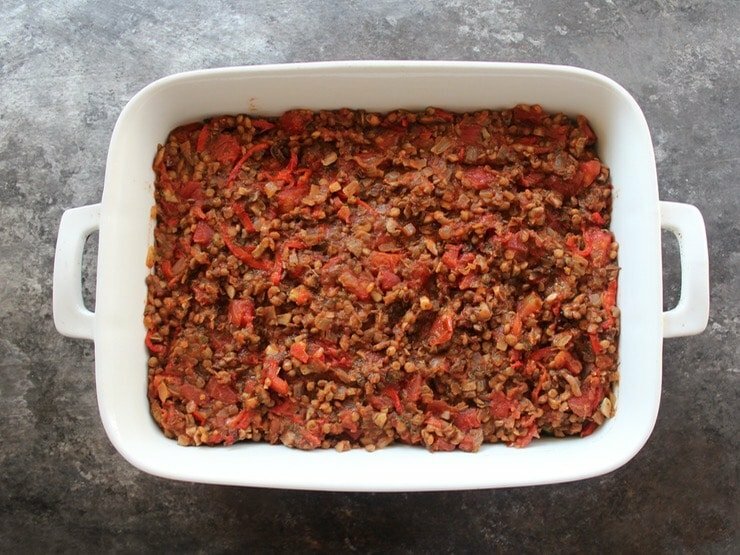 Spread the lentil mixture evenly in a single layer across the surface. 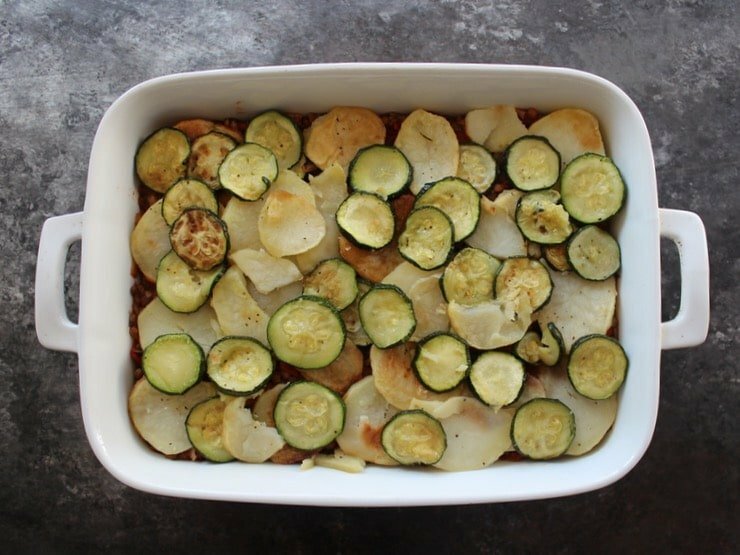 Place the rest of the potatoes and zucchini in another layer on top of the filling. 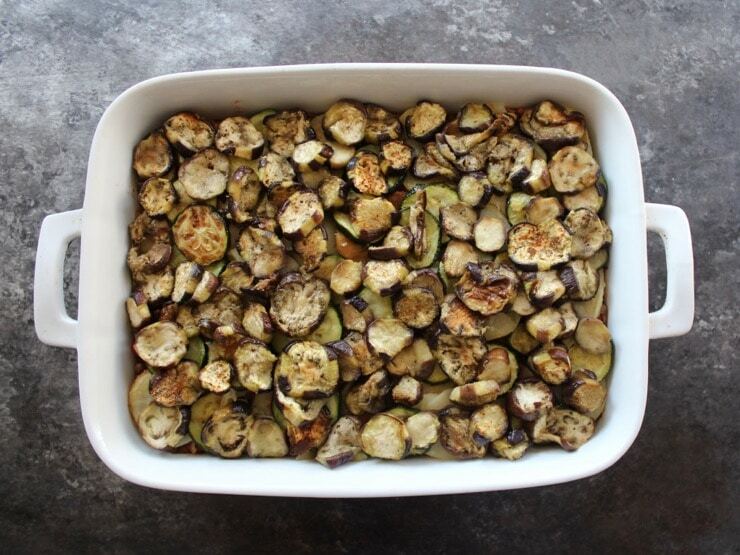 Finish with a layer of the remaining roasted eggplant slices. If you are making ahead, at this point you can cover the baking dish tightly with plastic wrap or wax paper. Place in the refrigerator for 1-2 days prior to cooking. If you are cooking the moussaka now, place it in the oven without the topping for 20 minutes to bake at 375 degrees F. Meanwhile, while the moussaka is baking, make the hummus topping. Blend together the cooked chickpeas, almond milk (or other dairy-free milk), salt, pepper and nutmeg for 1-2 minutes until very smooth. Reserve. Heat up 2 tbsp olive oil in a medium saucepan. Cooked the minced onion for several minutes over medium/medium high heat, until the onion is very soft, translucent, and starting to turn golden. Add the minced garlic and sauté for 1-2 minutes longer until fragrant. Whisk in your flour or gluten free flour substitute. It will clump together a bit. 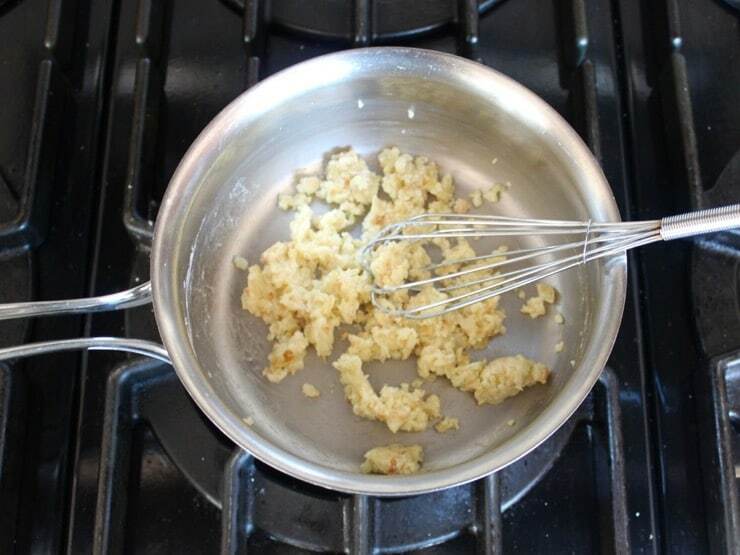 Add the blended chickpea mixture to the saucepan and whisk over medium high heat, stirring frequently, until smooth. 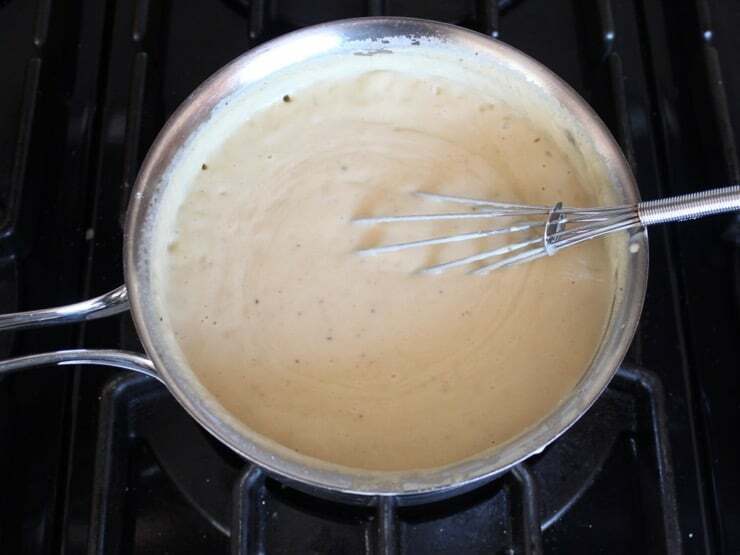 Continue whisking frequently until it boils around the edges and thickens. Remove from heat. Add additional salt or pepper to taste if desired. Note: The moussaka should be baked without a topping for 20 minutes at 375 degrees F before adding the hummus topping. If you have made your moussaka ahead, take it out of the fridge, uncover it, and bake it for 20 minutes prior to adding the topping. Remove the moussaka from the oven. Pour hummus topping evenly over the top of the moussaka. Your 2 quart dish may seem quite full, but that is what makes for hearty slices. The topping will not puff up much during baking so it shouldn't overflow unless you fill the dish to the very top. Only use as much of the hummus topping as you need. Sprinkle with 1 tsp paprika. Put moussaka back in the oven. Cook for another 30 minutes until the moussaka is cooked through and the edges are bubbly. If the top isn't evenly browned, you can turn on the broiler and broil it for a minute or two-- keep a close eye on it to make sure it doesn't burn. Don't broil if using a glass baking dish. Garnish with fresh chopped parsley. Serve warm. It will slice more cleanly and pieces will hold together better after it has cooled off a bit. Enjoy! Can this dish be made completely ahead of time, refrigerated, and then warmed for serving purposes? Yes, however I prefer prepping everything up until the topping stage, then adding the topping and baking fresh before serving. It will taste best that way. But you can make the whole thing ahead if you’re really short on time. Hi Judy! They should be added during step 12 with the other ingredients for the filling. Enjoy! Hi. I was wondering if this would freeze well — either the roasted vegetables half, or the whole thing. I bought all the ingredients to make the day after Thanksgiving but my company just called to cancel! It would be great if I could make now and freeze until Christmas. Hi Janet! I have never frozen this, but I think the roasted vegetable half should freeze nicely. I would make the topping fresh and bake it when you thaw in December. Let me know how it works for you! I did freeze the vegetable portion, then decided to serve it a few days later. I defrosted it most of the way then baked for a little longer than the 20 minutes called for. I made the topping fresh and baked again. It was delicious! Great! Thank you for reporting back, this is helpful for other readers. Glad you enjoyed it! I love your vegetarian mushroom barley soup. I just tried the vegan moussaka. You are correct that planning is essential, but SO worth the effort. It is delicious. This recipe looks great, I will surely try it soon! I normally make my bechamel sauce with cashews, almond or soy milk, nutritional yeast and flour and it comes out fine, but I am intrigued by this version. Thank you, keep the vegan recipes coming. Absolutely amazing recipe! Yes it is a lot of work, but it’s so worth it. I spread the prep out over two days as suggested, roasting the veg day 1 and assembling the casserole, then making the topping the second day. My guests gobbled it up, they couldn’t believe it’s vegan, it tastes so good and is so filling! I made this recipe yesterday and it did take some time, but oh it was so worth it. This recipe is very delicious and nutritious. I will definitely make it again. Thank you for this lovely delicious recipe. Wonderful! So happy you liked it. I agree, it is worth the effort. Another AMAZING recipe and perfect layout from you, which I cannot wait to make. I noticed you said you have a vegetarian version…would it be possible to either post it or maybe add the substitutions for it after the recipe? Tori, in step 17 you mention cheese. Did you mean lentils? I am drooling over these recipes and may have to revise my menu for break the fast. Hi Leigh – yes, sorry. I corrected it but apparently the cache didn’t clear. Instruction 17 should read: “Place the rest of the potatoes and zucchini in another layer on top of the filling.” Hopefully you can see it now. Thanks! Hi Nancy, my recipe input software auto-calculates the nutrition info based on the ingredients and servings. This recipe does contain many, many vegetables so it’s totally possible that it is accurate– however, not being a nutritionist I can’t say for certain. Sorry!